The Champion of Liberty issues first appeared in 1957, and they continued through 1961. These new commemorative stamps featured foreign leaders that were champions in the struggle for liberty in their own countries. Each of the stamps features a medallion, hanging from a ribbon, featuring the portrait of each of the leaders. The 1957 Champion of Liberty issue consisted of only an over-sized version of the 8 C. denomination, which was printed by the Giori Press and perforated 11. The 1957 issue is described at the top of the third column. From 1958 through 1961, each Champion of Liberty set consisted of two stamps, a one color 4 C. denomination, which was printed by the Rotary Press and perforated 10 1/2 x 11, and a three color 8 C. denomination, which was printed by the Giori Press and perforated 11. These issues will all be described below. 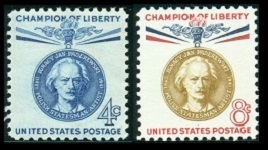 The two Champion of Liberty stamps shown above (Sc. 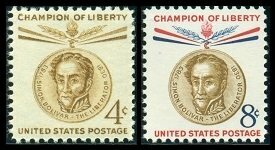 #1110-11) were issued on July 24, 1958 to honor Simon Bolivar. Simon Jose Antonio de la Santisima Trinidad Bolivar y Palacios Ponte y Blanco, commonly known as Simon Bolivar (1783-1830) was a Venezuelan statesman and military leader. He is regarded as one of the most influential leaders in the South American Wars of Independence. Bolivar led Venezuela, Columbia (and Panama), Ecuador, Peru, and Bolivia to independence from the Spanish Empire, forever changing the political landscape of South America. Despite some of his political faults, he is one of the few persons that have had such an impact on Western history, and he alone is considered the Father of His Nation in SIX DIFFERENT countries! Bolivar has also been regarded as a heroic symbol of the fight for independence in other Latin American and South American countries, as well. 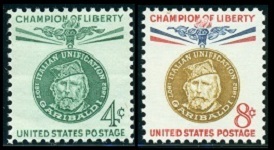 The two Champion of Liberty stamps shown above (Sc. #1117-18) were issued on September 19, 1958 to honor Lajos Kossuth. Lajos Kossuth de Udvard et Kossuthfalva (1802-1894) was a Hungarian lawyer, journalist, politician, and ultimately, the Governor-President of the Kingdom of Hungary during the Revolution of 1848-1849. During the Revolution of 1848-1849, Hungary declared independence from the Austrian Empire, and Lajos Kossuth became the Governor-President of the new republic, however the revolution ultimately failed. After the Austro-Hungarian Compromise of 1867, Hungary was granted their own parliament and internal self-government, but it would not achieve full independence until dissolution of the Austro-Hungarian Empire at the end of World War I. During his exile, following the Revolution of 1848-1849, Lajos Kossuth was widely honored in Europe, the United Kingdom, and the United States. During his visit to the United States, he became only the second foreigner, after the Marquis de Lafayette, to address a joint session of the United States Congress. He tried to persuade the United States, as well as the United Kingdom and the Kingdom of Italy, to intervene in the Hungarian struggle for independence, but he was unsuccessful in these efforts. There is a statue of Lajos Kossuth in the United States Capitol, which is inscribed "Father of Hungarian Democracy, Hungarian Statesman, Freedom Fighter, 1848-1849". 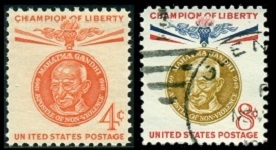 The two Champion of Liberty stamps shown above (Sc. #1125-26) were issued on February 25, 1959 to honor Jose de San Martin. Jose de San Martin y Matorras (1778-1850) was an Argentine General and the prime leader of the Southern part of South America's struggle for independence from the Spanish Empire. San Martin is regarded as a national hero by Argentina, Chile, and Peru, and, together with Bolivar, he is regarded as one of the principal liberators of South America from the Spanish Empire. 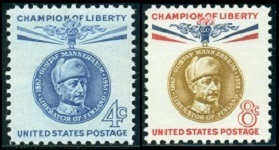 The two Champion of Liberty stamps shown above (Sc. #1136-37) were issued on September 29, 1959 to honor Ernst Reuter. Ernst Rudolph Johannes Reuter (1889-1953), was the mayor of West Berlin from 1949 to 1953, during the time of the Cold War. Between 1931 and 1933, Reuter was the Mayor of Magdeburg and then a member of the Reichstag. When the Nazis came to power in 1933, he was imprisoned in a Concentration Camp for two years. After his release, he fled to Turkey, where he lived until the end of World War II. After the war, Reuter was elected the Lord Mayor of Berlin, but the Soviet Union withheld their required consent for him to take office. In September 1948, he was elected Mayor of West Berlin by a overwhelming majority of the voters, and during the early days of the Cold War and the Berlin Blockade, he became the voice of resistance for the people of West Berlin. In Western Europe and the United States, during the Cold War, he became the symbol of resistance to Communist tyranny. He is one of only two post-war German politicians, after Konrad Adenauer, to appear on the cover of Time Magazine. 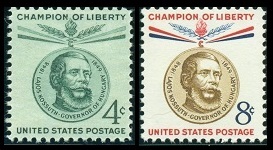 The two Champion of Liberty stamps shown above (Sc. #1147-48) were issued on March 7, 1960 to honor Thomas G. Masaryk and to celebrate the 110th Anniversary of his birth. Tomas (Thomas) Garrigue Masaryk (1850-1937) was a Czechoslovak politician, sociologist, and philosopher. An advocate for Czechoslovak independence during World War I, Masaryk became the founder and first president of the Republic of Czechoslovakia. 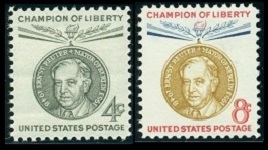 The two Champion of Liberty stamps shown above (Sc. #1159-60) were issued on October 8, 1960 to honor Ignacy Jan Paderewski. Ignacy Jan Paderewski (1860-1941) was a Polish pianist, composer, politician, and a spokesman for Polish independence. He was the prime minister and foreign minister of the new Republic of Poland during 1919, and he represented Poland at the Paris Peace Conference in 1919. 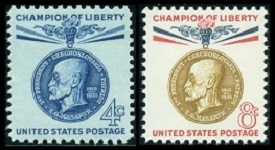 The two Champion of Liberty stamps shown above (Sc. #1165-66) were issued on October 26, 1960 to honor Baron Gustaf Mannerheim. Baron Karl Gustaf Emil Mannerheim (1867-1951) was a Finnish military leader and statesman. When Finland was part of the Russian Empire, Mannerheim served in the Imperial Russian Army, attaining the rank of Lieutenant General. Mannerheim later served as a military leader during the Finnish Civil War (1918), as the Regent of Finland (1918-1919), as the Commander-in-Chief of Finland's Defense Forces during World War II, as the Marshal of Finland, and as the 6th President of Finland (1944-1946). Due to Mannerheim's unparalleled role in establishing and preserving Finland's independence from Russia, he has been regarded as the father of modern Finland. In a survey taken over fifty years after his death, Mannerheim was voted the greatest Finn of all time. The two Champion of Liberty stamps shown above (Sc. #1168-69) were issued on November 2, 1960 to honor Giuseppe Garibaldi. Giuseppe Garibaldi (1807-1882), actually born in France, became an Italian military leader and statesman. He played a major role in the Italian Wars of Independence, leading to the establishment of the unified Kingdom of Italy. After unification, he served in the Senate of the Kingdom of Italy from 1861 to 1882. Along with King Victor Emmanuel II and Giuseppe Mazzini, Garibaldi is considered one of the three Fathers of the Fatherland (Latin: Pater Patriae). 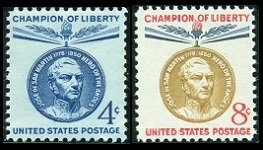 The two Champion of Liberty stamps shown above (Sc. 1174-75) were issued on January 26, 1961 to honor Mahatma Gandhi. Mohandas Karamchand Gandhi (1869-1948) was the preeminent leader of the Indian struggle for independence from the British Empire. "Mahatma", the other name that Gandhi is commonly known by, is actually an Indian title meaning "venerable". Through his methods of non-violent civil disobedience, Gandhi led India to independence and inspired other movements for civil rights and freedom across the World. Indians regard Gandhi as the father of the nation. His birthday is celebrated in India, as a national holiday, and around the World, as the International Day of Nonviolence. The 8 C. denomination commemorative stamp shown above (Sc. 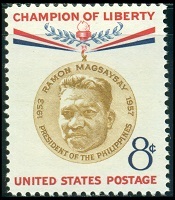 #1096) was issued on August 31, 1957 to honor Ramon Magsaysay. Ramon del Fierro Magsaysay (1907-1957) was the 7th President of the Republic of the Philippines, from 1953 to 1957. He was killed in an aircraft accident on March 17, 1957. At the beginning of World War II, Magsaysay joined the Philippine Army as an automobile mechanic. After the fall of Bataan in 1942, he escaped to the hills, where he organized the Western Luzon Guerrilla Forces. Magsaysay was one of the guerrilla leaders instrumental in clearing the Philippine coastline, prior to the landing of American forces in January 1945.